Episode 16 of Kaiji season 2 sees Kaiji starting his final assault on the bog. 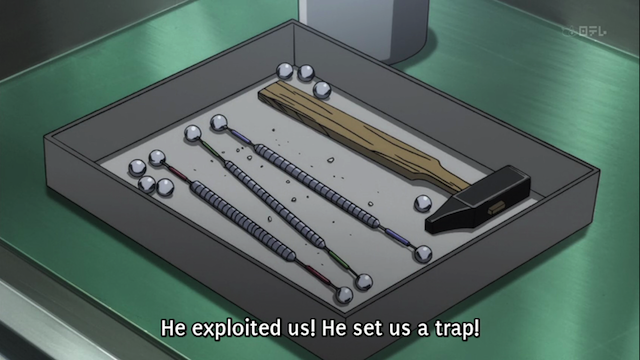 Unfortunately by episode end the most obvious part of Kaiji’s plan has been discovered. The details were pretty interesting, including a false lead in which Ichijou falsely accuses Kaiji, before he discovers how Kaiji has juiced the machine. Of course after Ichijou confirms that Kaiji is cheating he applies the block. The question now is, does Kaiji have a plan for dealing with this new obstacle? And, of course, conquering the block will only get him to the first of three pans. Further, Kaiji has only a few hours to pull off a victory.